Thanks to CJs generosity, I was finally able to finish up Stargazer this evening. She sent me the last little bit of beads that I needed to finish the piece. I am so increadibly pleased with how fabulous she turned out. Here she is in all her glory. If the baby still isn’t here by the weekend, I will take Allen out to shop for a frame for her. YEAH!! 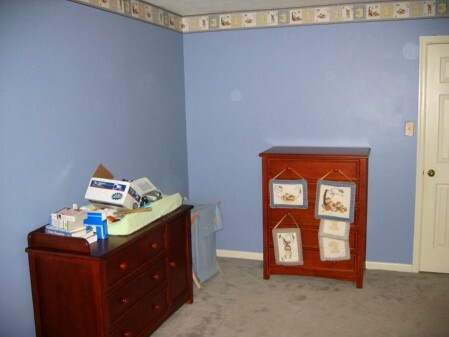 To keep with the blue theme of this post, I also have some pictures of the baby’s nursery. Allen finished hanging the border and replacing all the outlets this weekend. Now we just need to put away all the tools and put the rest of the baby “stuff” where it belongs in the room and we will be set. No rush as he will be sleeping closer to us for a little while at least. Here are his two dressers. Hanging on the taller dresser are the wall hangings that match the border and crib set we picked. Here is his bookshelf and the corner of his crib. When he moves into the room we will put the glider in the corner by the window. And now time for bed:) I am a sleepy Leslie! Congratulations on the finish, she is really quite stunning! Great job on the babies room, the furniture is beautiful and I really love the colour scheme. I bet you just can’t wait to meet your little one soon. Look after yourself. Congratulations on the finish, Leslie, she looks wonderful! Oh Leslie, she is fantastic! Well done! I can’t wait to start myself now. Baby’s room looks really lovely. I like the dark furniture you’ve chosen and that crib is really unusual with the higher side. You are so close now. Does it feel strange to think you could have a little baby in your arms by weekend? Congratulations on your beautiful finish! The baby room is lovely. That IS a spectacular finish! HURRAY YOU!!!!!! Stargazer is amazing but I bet the next finish (the baby) will be even more spectacular! I love the baby’s room – it looks so warm and inviting. The crib is gorgeous with the baby quilts just waiting for the little one to come! Stargazer really looks wonderful! 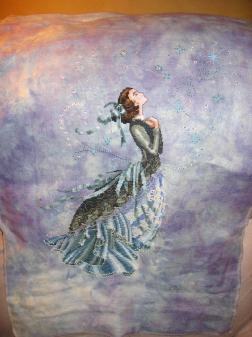 I love how it turned out on that fabric. It really adds to the design. I can’t believe you might have a baby this weekend! Where did the time go? Take care of yourself and that little one. I hope Allen will post when you have the baby! She is beautiful. The fabric is perfect. The baby’s room is adorable, too. Perfect room for a sweet baby. Happy Thanksgiving! Wow–you’re totally amazing! Pregnant, AND you finished the room beautifully (I’d still have the paint brush in my hands when the contractions started) AND you finished your RR early and got it to me early AND you finished Stargazer! Superwoman! I’m so looking forward to baby pics! Best wishes for a painless, easy delivery. So happy for your finish on Stargazer Leslie. It looks fabulous! As does the baby’s room. I’m so excited for you and your impending arrival. Your baby’s room is just gorgeous Leslie – I love the colour you have used and everything looks so welcoming. Well done on getting Stargazer finished too. Looking forward to hearing of your baby’s arrival, wishing you and your DH all the best. Take care. Congratulations your stargazer is awesome!!! Congratulations on the finish! It is gorgeous! 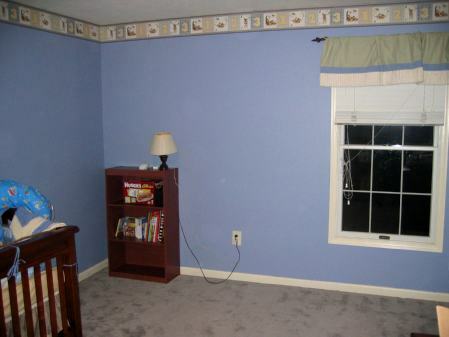 The baby’s room looks wonderful, that blue is really nice.